Another new trailer from Comic-Con, this time for the upcoming seventh season of The Walking Dead. The zombie apocalypse drama was left at the end of season six with Negan (Jeffrey Dean Morgan) preparing to kill one of the main characters in the much discussed finale. 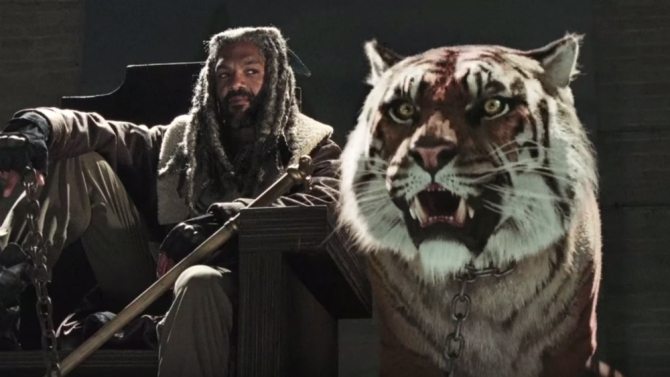 The trailer also gives a first-look at actor Khary Payton as King Ezekiel with his pet Tiger (pictured above). A fan-favorite character from the comic books, which the series is based, King is the self-proclaimed “king” of a community called “The Kingdom”. The Walking Dead Season 7 will begin Sunday, 23rd October. FOX UK airs the series in the UK.